Thanks! That’s exactly what I needed to see as both of my hammocks are from Dream Hammock and I didn’t want to remove the whoopie sling altogether, but needed to modify it once in a while for the short hangs. That’s the main reason why I switched back from whoopies to a cinch buckle suspension. Much better suited for tight hangs. Especially if the buckle is close to the hammock. Good idea. Whoa, it would not have occurred to me that you could do the Becket Hitch around the Amsteel continuous loop with something as big/wide as the webbing! Pretty much every description I’ve seen of the Becket Hitch or the Sheet Bend says to have the larger line be the eye, but doing it this way really does seem to work. It works great! Holds well and unties easily after being loaded. I’ve found that the contrasting sizes of line and webbing does well to hold. Amsteel on Amsteel is dangerously slippery and requires a double becket hitch to hold and is more difficult to loosen. Great tutorial! This is very helpful. Like you I camp mostly out west and there always seems to be a frustrating lack of trees at far too many campsite. I do have one question for you though, can you give me any additional information on the rocking hammock stand being used in the video? I’d appreciate it if possible. Thanks! Sure! The stand is the BooneDox Drifter stand. Very portable. I Love that stand! Thanks for the link. I want one for my Bedroom! How would you use a rainfly with the Drifter stand for camping? 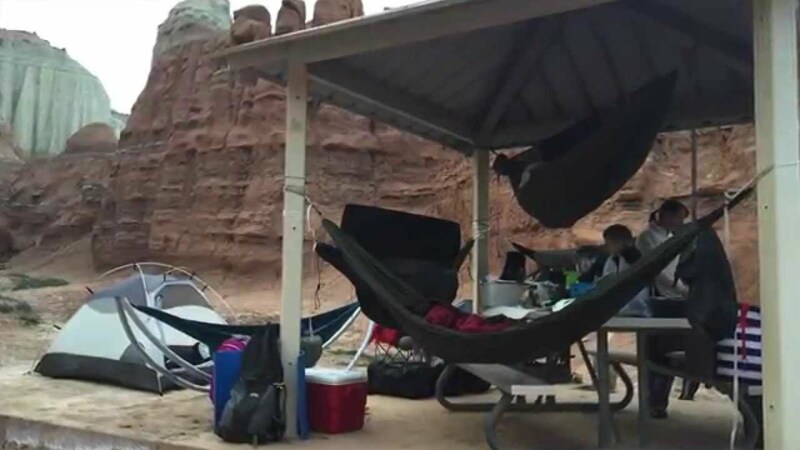 I think I would use Tent posts and a tarp… Only if it may rain while camping. Boone Dox sells a tarp and bug net that you can attach directly to the stand. However, you need to ratchet the stand together first otherwise the natural bowing when weighted will cause the tarp to sag. If you use trekking poles to pitch a tarp off the stand, you’ll want to anchor the stand otherwise you can easily rock and pop the tarp. Great tutorial! I really like the double fisherman’s knot on the amsteel. Do you think this is a reliable permanent knot for amsteel as an alternative to splicing? Great, thanks! I tested some other knots in amsteel blue with good results but I was concerned about slipping. I like the double fisherman’s knot better than what I was using. Long term, I would recommend splicing, particularly with 7/64 Amstel. Just for clean lines, better break strength.